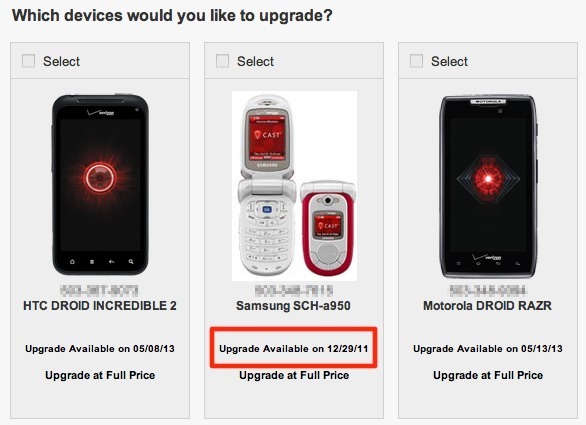 First, you may want to check your Verizon account to see what the status is on your upgrade date. The middle account of mine above previously had a much later, like 2012 date and is now showing as December 29. And I’m not the only one seeing this change. A reader tipped us to his account that has now been switched to 12/19, yet he bought the DROID Bionic on the 2nd day it was out back in September. I’d say Big Red wants to make a big end of the year push to get you into one of their new top tier phones like the Rezound (review), RAZR (review) or Galaxy Nexus (whenever it comes out). Facebook On Android To Receive Another User Interface Overhaul Soon?